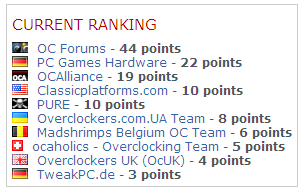 After months of HWBOT competitions where enough money to buy the finest overclocking gear would assure the top spot, the May dual socket competition has descended upon the heads of the mighty and meek alike. No longer will large amounts of capital give a clear edge. Many of the boards available to users do not allow for today’s “one touch overclocking” like you see in many boards. In fact, many have no features at all. If they do overclock, the secrets to make it so are closely guarded by a few dual socket enthusiasts. This means it comes down to tweaking and skill, a couple of items sorely missing in previous challenges. As mentioned above, the Hwbot OC Challenge is for dual CPU setups. Think, the SkullTrail platform for socket 771 (same gen as 775) and the Evga SR-2 motherboard (socket 1366) to name more modern implementations. The other sockets being used are socket 604 (Intel), 940 (AMD), 462 (Socket A, AMD), 370 (Intel P3 days), and socket F (AMD). The benchmark of choice for this challenge is Wprime 32! Putting all this horsepower together will surely show some great times for each benchmark and each generation of CPU. Now that you know what its all about, it’s time to give these guys a pat on the back for their efforts. So far in the competition, 18 days in, we have a TWO MAN wrecking crew that have built a commanding lead that the other teams will be hard pressed to overcome. OCF’s very own Optytrooper and Torin3. Of course, the competition isn’t over until May 31st, so let’s keep our collective fingers crossed to watch this tandem tear up the HWBOT OC Challenge for May in the name of Overclockers.com! Congrats Opty and Torin, Keep up the good work!!! Whoa.. PCGames jumped up like 10 points since yesterday!!! Dont rest on your Laurels! 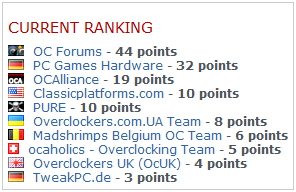 We are beating PCGames in each category except socket 604 and socket 1207 - they submitted a socket 1207 run yesterday which got them 10 points. No one else has competed on that platform yet. Optytrooper is the one who should be getting the lion's share of credit here. I've only got 1 platform, he has got all the rest! P.S. you might want to change the link to the profile. I'm Torin3, not Torin. Hmm actually, we need a socket 1207 system. I don't think opty (or any of the benching team, for that matter) has one. One of you must have access to one! A terrible, stock clocks, wrong OS, untweaked run is far better then no run at all! Contacted Rav3n and shadowmonk by email, waiting to hear back. I think they may have had quad fx rigs that fit the bill. Those were the only people I could dig up trying to search, but its a long time ago and hard to really find people that mention having it. Expect better runs out of me in 462 and 604 very soon. Just waiting on some odds and ends to arrive. I'm hoping to get a dual DICE socket 604 run in just for show but I'll go where the points take me on air first as I'll likely kill the board. Excellent guys, I only have a single socket 462 mobo, so, can't help on this one but keep benching guys. I'll be working it this weekend and maybe cooking up something or cooking up a few pieces of silica. You guys are doing well, just don't let those other guys sneak up on you. CP is the only team I'm really concerned about. The rest of those guys are bush league in my book. They got bones. I know I'm better than their best. I'm certain as one can be that torin3 and I are going to take this challenge. :censored: HAVE EM GUYS !! :rock: whats going on with the 1207 socket then ?? I sold my quadfather about 3 months ago. Would have come in handy now.